You don’t have to be stupid to be a BNPer, but it helps. 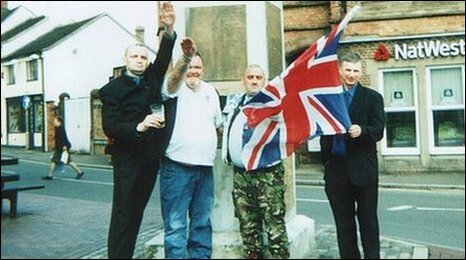 Nazi saluting BNPers in Stoke. In other news, the BNP’s chief knucklehead of London, Bill Bailey, may be arrested for his violent conduct during the election, about time too. Update 1: Ops, it seems it was from 2002, still BNPers giving the nazi salute tho! A hit tip should have gone to Jim on this. Update 3: And another BNPer using the Nazi salute in 2010. According to the Beeb nearly all the votes are counted in the Hungarian election and it seems that the neofascists in the Jobbik Party will have about 47 seats in the new parliament. With approximately 12% of the vote they have a sizeable bloc in the Hungarian political system. One can only wonder how this will galvanise neofascism in Eastern Europe. How depressing. “A teenage former milkman helped his father to run a white supremacist movement that plotted to overthrow the Government, a court was told yesterday. Nicky Davison, 19, was accused of co-founding the “Aryan Strike Force”, an online far-Right movement that aimed to bring “total victory” by toppling a Government they claimed had been “taken over by the Jews”. Mr Davison’s father, Ian, 41, a DJ, has already admitted six charges in June last year, including terrorism and producing a chemical weapon. He was discovered in possession of ricin, which can prove fatal if even an amount equivalent to less than half a grain of sand is inhaled or injected. “The Aryan Strike Force was in essence a website to which people interested in its aims subscribed,” Andrew Edis, for the prosecution, told Newcastle Crown Court. “But its purpose was to form a group that would be ready to act. It was set up to advance the aims of white supremacy in these islands and fight what they call ‘Zog’, which means Zionist Occupied Government. Update 1: The slackbastard’s take on things. “Andrew Edis, prosecuting, told the court that the website was set up to form a group that would be ready to act and fight what they called “ZOG”, which stood for Zionist Occupied Government. Davison and his father were not simply “keyboard warriors” but were more interested in action. The court was shown videos from the website which included pictures of the fall of the British Empire and footage from the September 11 Twin Towers attacks, which it claimed was one of the atrocities of Islam. Update 3: Edmund Standing has a typically well-informed post on these neo-Nazis. Also look out for his post on the Nazi saluting BNP candidate. It is often very hard to distinguish the real thinking behind remarks left at Comment is Free. Some are obviously offensive, others are openly racist and many others are borderline, full of euphemisms, twisted reasoning and questionable assumptions. Plus the fact that many of the most extreme racists have learn to hide their views under a mountain of verbiage or post-modernist twaddle. So articles like that of Efraim Zuroff’s No time limit for Nazi convictions are most welcome, not only for their content but as they serve a secondary purpose of highlighting those with sympathies for the Extreme Right. I will leave readers to analyse the full content of the thread, some 159 comments and see how even on this topic certain Far Right posters on Comments is Free can’t resist making snide remarks about Jews or Israel. I am sure readers will notice that those on the thread so sympathetic to Heinrich Boere are often equally bitter against Israel and Jews, which is hardly a coincidence, is it ? Not that the Guardian would like it if a fair few of its on-line posters were thought of as neo-Nazis or their sympathisers? I was going to cover the BNP and how people shouldn’t be fooled by the new membership criteria forced upon them by the Equality and Human Rights Commission, but Nick Lowes does it far better and Phil has a good post on it too. The Times journalist Dominic Kennedy and the BNP. Their profile of Richard Barnbrook. Searchlight is a great article on who really owns the BNP. More at Lancaster Unity and Kirklees Unity. Neo-fascism On The Sofa, Courtesy Of The BBC. You might almost get the impression that the BBC were vaguely sympathetic to the BNP or wanted to assist their growth? Why else should the BBC want to provide these neofascists with the platform and normalise their views? I’m not sure that it is as clear cut as that, but the BBC’s QT decision to invite Nick Griffin, BNP leader, started the ball rolling. The Daily (Maybe) informs us that Griffin was recently invited to the Politics Show North West, last Sunday, 6th December 2009. It is on Iplayer (35:00 in), what a spectacle. Treating a climate change denying neofascist as if his views are worthy of consideration. The BBC seems to have lost all editorial judgement in this matter, but it probably helps their viewing figures so they’re not going to complain. Peter Cranie explains it well. When, in years to come, people look back of the growth of British neofascism I suspect that sizeable blame will be placed on the BBC for legitimising the BNP’s views, aiding their propaganda and increasing their public profile.